Women’s feet ache for many reasons. Often they begin to hurt after a lifetime of pointy-toed high-heeled shoes, bad foot care, and the symptoms of menopause. I have known several women with a condition called Morton’s Neuroma as well. A neuroma is a thickening of nerve tissue that may develop in various parts of the body. 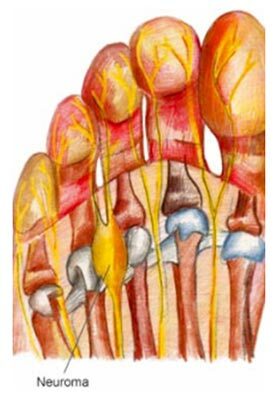 The most common neuroma in the foot is a Morton's neuroma. This is the herbal and alternative treatment for the foot that was suggested. The condition improved for these women using these herbs and essential oils, using daily massage and exercise on the foot and changing the type of shoes. After a period of use, all the women were able to go back to wearing high-heeled shoes but without the pointy toe box. It was also suggested that they use a professional shoe stretcher on their shoes (2-way shoe stretcher); one that is able to stretch the shoe exactly where there is a problem as well as and a metatarsal sleeve. These treatments and others are list in both the Aromatherapy Studies Course and the Herbal Studies Course as well as information in the book, page 61, Herbs & Aromatherapy for the Reproductive System. There are various treatments to treat the pain and possibly treat the condition as well. Essential oils are very helpful as analgesics to treat pain, and often to assist in curing the condition. Essential Oils for the Foot include those that are in our Sports Relief Kit. It contains six individual oils including the rare Blue Sage, Basil and Bruise Juice which is a great choice for someone who wishes to carry the correct oils with them for ease of application and quick availability. A Helichrysum based product is most effective. Helichrysum is more anti-inflammatory than German Chamomile, and often more tissue regenerating than Comfrey or Lavender and is both anti-inflammatory and analgesic. It is said to have corticoid-like effects. A 10-15% essential oil formula in Calophyllum oil and Calendula infused oil, thickened with beeswax. Beeswax – enough to thicken or leave out for an oil-based therapeutic. 1 oz = 30 ml; therefore there would be 3 — 4.5 ml of the essential oil blend in this formula. This particular oil can be requested from Jeanne Rose Aromatherapy; the cost is $35/ounce. Apply the oil-based product by application at least twice per day. A few drops should be rubbed into the area in the morning before you put your shoes on and at night before bed. If possible the oil used in the formula should be made with fresh Calendula flowers and freshly picked and grated Comfrey roots. The Calendula infused oil can also be mixed with Bruise Juice at 50•50 – both of which are available freshly made-to-order. Herbal treatments recommended in the Herbal Studies Course include Rosemary, Comfrey White willow bark, Clove Buds and other analgesic, and anti-inflammatory herbs. Rose, Jeanne. 375 Essential Oils and Hydrosols. Berkeley. Frog Ltd., 1999. Rose, Jeanne. Herbal Body Book. Berkeley. North Atlantic Books, 2002. Rose, Jeanne. Private Notes from 1973.